What are the actual facts of the matter? The accident where Sathya Sai Baba slipped in his bathroom and fractured his hip occurred on June 4th, 2003. This was his second hip fracture, the first having been on 9/8/1988 when he slipped on the soap in his bathroom. My wife and I were at the first interview he gave after this accident where he sustained a hairline hip fracture (a VERY painful event, as he told us himself!). It is clear that neither Sathya Sai Baba can no more learn from experience than can the average Indian architect (considering how water from basins etc. is so often 'recirculated' onto the floor etc.). From the start of the 2003 injury, the ashram authorities issued various false statements in an attempt to cover up and, failing that, to minimize this fact. For example, Dr. Michael Goldstein, Chairman of the Prashanthi Council, circulated a brief account stating "Our Beloved Bhagawan Baba had a small accident in which he fell and sustained an injury to his hip. Subsequently, he underwent a minor surgical procedure and is responding extremely well." (i.e. nothing like what Sathya Sai Baba himself later blew it all up to be... something that would normally take 2 to 3 years of convalescence! See professional orthopedics evidence). However, a report from a devotee who lived with Sai Baba's sister Venkamma and who defected in 2005 makes clear that there were further fractures which remained unannounced (see below). It was typical of those around Sai Baba to cover up all possible incidents that could make him seem less than omnipotent and divine. "What medicine did I use? The intense prayers of the devotees are My medicine. During the last one month, be it in Madras (now Chennai), Hyderabad, Bangalore, or Mumbai, devotees have intensified their prayers and spiritual activities. Each and every house conducted bhajans and Namasmarana. Some devotees undertook penance and performed Yajnas. In this manner, a number of spiritual activities were undertaken praying for the well being of Swami. It is as a result of such fervent prayers that I am able to stand before you and address you. Neither did I want this suffering nor did I desire its cure. You wanted this body to be cured of the pain, and you achieved it through your prayers. This body is not Mine. It is yours. Hence, it is your responsibility to look after this body." Comment: Now if the prayers and spiritual activities of the devotees were enough for Sai Baba's total recovery from his hip and eye problems, then what was the need for two operations? Why didn't Sai Baba just sit back and let the magic bhajans work? What exactly does Sai Baba have more faith in, bhajans or modern medicine? "When I fractured My hip, it was not possible to even move My leg. The slightest movement caused excruciating pain like that of an electric shock. I told the doctors, 'This is not My body. This is yours. You may do whatever you deem fit.' One who has given up body consciousness will have no suffering at all." Comment: So the answer to the question is ...? Did Sai Baba feel pain or didn't he? Was there no suffering experienced or did he experience excruciating pain? Confusion confounded! "After the operation was over, he [Satyajit] asked, "Swami, how could you bear such pain and suffering?" I told, 'The love of devotees like you is My strength.' The power of love is the ultimate. You can overcome any pain or danger with the power of love." Comment: So if Sai Baba was not feeling pain, why would someone like Satyajit (Sai Baba's personal male servant) ask the question in the first place? Surely Satyajit would be more than familiar with the Baba's capacity to be unaffected by pain. "During midnight, at the odd hour of 1 o' clock or 2 o'clock when I get up from the bed and look around, I find these two boys Satyajit and Dilip sitting one near My head and the other at My feet, safely guarding this body." Comment: What is the need to guard a divine body that is free of suffering and does not experience any pain due to a lack of bodily consciousness? As if the ashram itself isn't heavily guarded, what is the need for two boys in the Baba's own bedroom? And since when did the laws of space and time change so that the hours of 1am and 2am are to be included in the 'midnight' category? Note also that he had two very young men at his bedside, as he has always had for many years and for reasons reported by many to be quite other than guarding him! "For the past one month, all of you could not have Swami's Darshan. What is the reason? The reason is the ill health of this body. I have neither taken upon Myself the illness of anybody nor has it emerged from this body. Today I am revealing the truth to you." "You are all aware that I suffered a fracture of the hip joint; the bone broke into three pieces and the ball also got separated. The excruciating pain one suffers in such a condition cannot be described in words. It is not possible to move this way or that way. The body suffers pain as if subjected to electric shocks. But I was unaffected by it. I underwent all this suffering in order to demonstrate that one should transcend body consciousness and develop Atmic consciousness. I am not this body." etc. Sai Baba also told of the hip injury and operation... the most absurd bit: Explain this self-contradicting "miracle" anyone who can: "But I was unaffected by it. I underwent all this suffering"! "The age of this body is 78, due to the incident the hip had broken and bone had become into pieces, because of age it cannot become normal without operation. Gone is gone so removed it, what was happened has happened for our good and this is a good experience for you all too. The bones were removed and steel rods were inserted .Swami said, before entering the operation theatre I told to doctors? This is not my body, do what ever you want to do with it?. After 3 hrs of operation, Swami Came out smiling and everyone around were surprised. Swami told us smiling when you are in pain is Greatness; the pain is only for the body. Swami said? I am divinity in Humanity? If I express my pain I'm like any human." 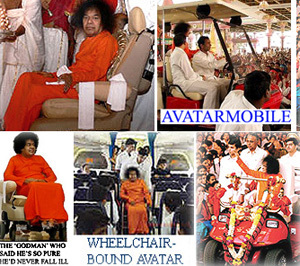 Manojap also reported that Sathya Sai Baba said his bones are "as strong as diamonds". That would be a massive hindrance to anyone... diamonds are brittle, one sharp blow can split them! 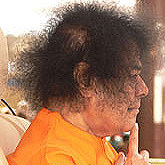 Using a hammer on diamonds - as Sathya Sai Baba boasts was done on his bones - would have been fatal if they were that hard! This is just the usual Sai Baba hyperbole and self-enhancement. While he stated to the group in an interview after his first hip injury that his body was the same as any other person and subject to the very same laws and conditions, he contradicts this by pretending his bones are 'hard as diamonds' Such a trite and patently false boast! The farcical repeat of the banana skin trick in his private apartment shows he does not learn from experience and his alleged omnipotence is not working any more than his omniscience warned him of the slippery slope he was about to encounter. This is the lighter side of his favourite jibe to some people in interviews, "dirty bathroom"? 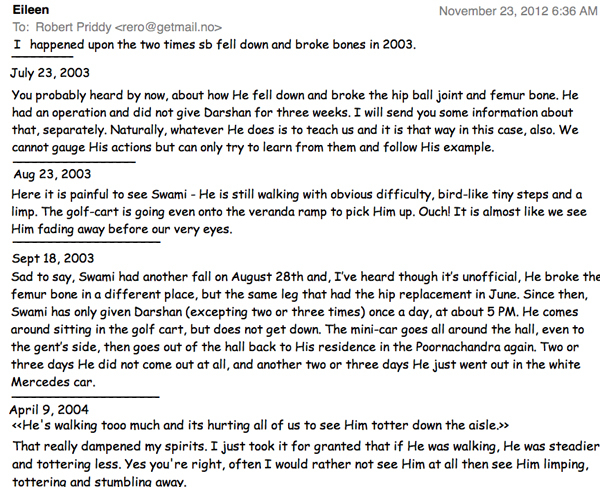 Swami then told Mr. Sundareshan, the orthopedic Surgeon who had performed the operation to Bhagawan to speak to us on the incident. Mr. Sundareshan said ? Swami had broken his hip and stayed like that for 18 hrs, which is not possible for any human being to resist ? Swami had started walking after 5 days of the operation which is also impossible for any human being. One of Sathya Sai Baba 's attendants among the seven or eight doctors who were present at the time of the surgery, Dr. Krishnamurthi, would have us believe that Sathya Sai Baba walked the very first day after his op. What kind of walking, one wonders. If at all normal, then why did it take him so long to come out to his devotees? Three months afterwards, he still hobbles when he walks and he needs his golf car, so is the cure yet not complete? The implant for a total hip replacement is composed of 3 parts: the stem, the ball, and the socket. The stem is made out of metal, usually cobalt-chrome or titanium, and is placed within the native thighbone. The ball is usually made out of polished metal or ceramic, and fits on top of the stem. The first day after surgery will have a lot of activity. You will meet our physiotherapists, who will instruct you in more exercises to perform while in bed. In addition, they will help you stand and take a few steps with a walker. You will be taught the positions to avoid with a hip replacement, as well as the safe positions. In the next few days, you will find it easier and easier to move about. Generally, patients are able to walk as much as they want by 6 weeks post-operatively. Hip replacement surgery, Dr. Skinner says, is one of the best operations humans have invented. Many patients feel so good after the surgery they believe they have no physical limits, though Dr. Skinner strongly discourages strenuous activities such as tennis and skiing. The results of a hip prosthesis are usually excellent. The operation relieves pain and stiffness, and most patients (over 80%) need no help walking.The results of a hip prosthesis are usually excellent. The operation relieves pain and stiffness, and most patients (over 80%) need no help walking. You will remain in the hospital for 3 to 5 days after surgery. "Usually, people do not spend more than 10 days in the hospital after hip replacement surgery. Full recovery from the surgery takes about 3 to 6 months, depending on the type of surgery, the overall health of the patient, and the success of rehabilitation." But now it seems that things have changed somewhat? Is a hip joint that crumbles (as badly as Sathya Sai Baba virtually boasted), not ANY kind of disease? The degenerative illness osteo-arthritis probably best fits the bill. And who can't think of plenty of people who do not love Sathya Sai Baba? It is considered by many to be His leela to beguile us all into doubting Him, an inscrutable "test of faith"! But he is only human, and therefore one does feel some ordinary sympathy for his condition. The huge number of cures he has said in a recent discourse were sent him by followers shows that they too surely recognize his limitations and secretly view him as a mortal! And we are told by fatuous followers that he "cures himself only with the Love of his devotees" (while he has to have doctors rubbernecking and what can only be 'fake surgery' on the side to beguile us further into thinking he is a mortal) One still has to marvel and gawp at this stupendous mahima miracle... i.e. at the credulousness of so many otherwise probably quite intelligent persons who hide from the facts and distort nearly all they perceive through their twisted in-built 'Sai viewfinders'. Only those whose minds have literally been destroyed by the psychic powers, deceitful tricks, and crude psychological advice of Sathya Sai Baba can credit all this. Minds destroyed, but why then no cosmic realization of simple facts even? Funny that no famous thinkers or recognized experts in any field of knowledge anywhere in the world have ever bother with the Sathya Sai Baba phenomenon, isn't it? One would also think that religious heads like the Pope, the Dalai Lama, the Ayatollah, the Chief Rabbi , the Archbishop of Canterbury, the Shankaracharya of South India or someone of that ilk would have recognized him by now...ah well! 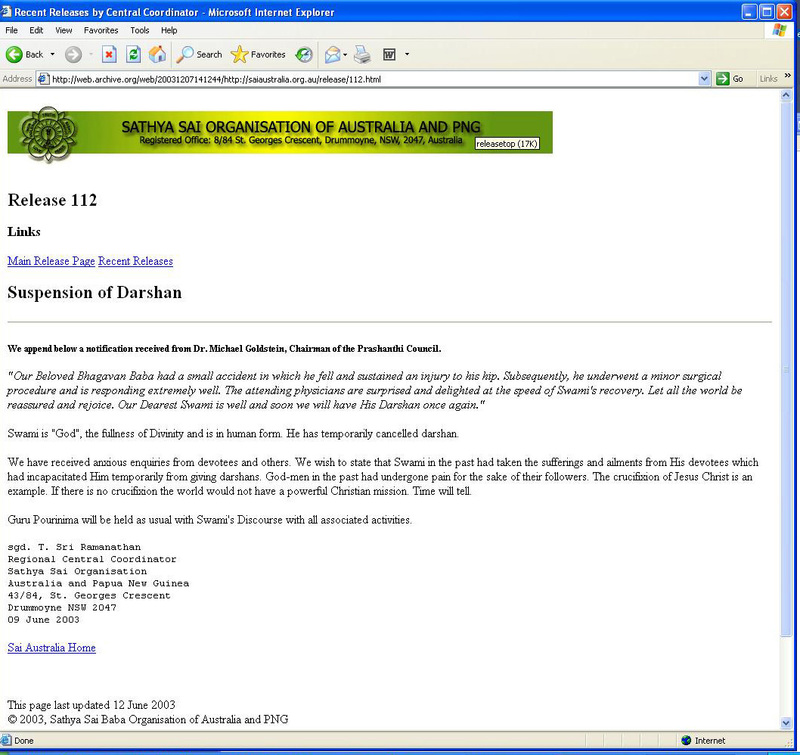 WHY DID SATHYA SAI LIE ABOUT ALL THIS? To avert the obvious thought - that he is not what he claims to be at all. That Sathya Sai Baba has said many incompatible and some wholly contradictory things about the causes of his illness and its cure amounts to lies... (certainly so if he were to be all-knowing, as he claims). Reportedly, since June 3, 2003, there have been very long periods without a glimpse of Sathya Sai Baba and there have been no normal interviews since then until the present. The few darshans Sathya Sai Baba has given have been very brief and he has not gone among the crowds, confining himself almost entirely to the more important leaders, verandah guests and students. Hip fracture can be most painful. For sixteen hours or so, Swami just ignored it, and later allowed it to be treated the way anyone else.........He did not go to any fancy hospital or even to His own Super Specialty Hospital but to the General Hospital [which incidentally started as a tin shed with just one tube light three decades ago].........Swami chose to have administered to Him the same treatment in the same hospital as all the poor who come to Him are treated. That, for me, is one fantastic lesson." And in any case, Sathya Sai Baba has repeatedly proclaimed that he is totally unaffected by any pain or suffering, so why all the fuss about him? The rumor has been that Baba is only giving darshan in the morning. As a result only a few people come in the morning with the hall being almost filled in the afternoon. I noticed that as soon as I sit down in the hall and look around a tremendous sense of peace and bliss overcomes me. I rather have the physical form in front of me but the peace, love and bliss is equally as strong without his physical presence as it is with his physical presence. If anybody is hesitating to come because Baba may not be giving darshan, this is a mistake. It is all here. Come. Sunday morning there were a few people in the hall, many of those left as the 7:30 mark was coming supposedly signaling the end of darshan. All of a sudden, there was Baba in the golf cart. People started running in to sit down. The slow moving cart came to the men's side. This was the first time all week. It proceeded toward the mandir turned right headed to the women's side and out. It was slow paced, brief and intense. Baba, once again, telling us to love his uncertainty. Among the more disgraceful claims made about this is the one about Sathya Sai Baba having had no recourse to any medical service other than those that the poorest peasants can get in India. The Indian poor are light years away from having hi-tech steel rod hip replacements with over half a dozen doctors attending, even though Sathya Sai Baba did not actually go to his Super-specialty hospital, but was treated by his specialists at the simpler one at Brindavan. Dr. Michael Goldstein's typical untruthfulness to cover over anything possibly untoward about Sai Baba. Never cuts his hair, he has said!